St. Paul, Minnesota – LS Black Constructors, a full-service construction firm located in St. Paul, MN, was awarded the $13,454,400 contract for construction of the annual training and mobilization dining facility at Fort McCoy, Wisconsin for the U.S. Army Corps of Engineers. Work is scheduled to begin this winter with completion anticipated for December, 2018. This new dining facility will serve approximately 1,400 people and is designed to replace several existing WWII era dining facility administration centers (DFAC) currently serving those in training at Fort McCoy. The new DFAC will consolidate food services, bringing improved service and efficiency to the staff and Reserve Soldiers. 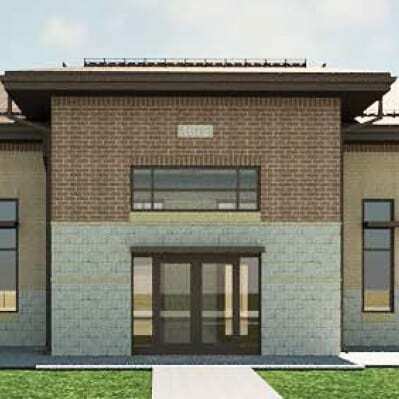 The facility will be built utilizing conventional masonry construction and a standing seam metal roof, providing a low maintenance and highly durable exterior. The facility will include a kitchen complete with areas for food preparation, cooking, serving, dining, dishwashing, potwash, refridgeration, cold and dry storage, and loading dock. The facility will also include support spaces such as administration offices, locker room, and waste disposal. This facility is designed to meet LEED Silver Certification from the USGBC. LS Black Constructors is a dynamic, full-service commercial construction company located in St. Paul, Minnesota. Serving both local and national clients for more than forty years, LS Black brings a yes mindset and a focus on teamwork and flexibility to drive excellence into all of their projects. The LS Black team leverages their proven processes and past experience to complete the toughest, most complex projects, never walking away from a challenge but facing it head on. The core principles of the firm are the backbone of everything they do and have built a culture of excellence that drives them to exceed expectations on every level.